Windows 8's PC Settings are like a special subset of User items you would find in Microsoft's familiar Control Panel. To get the most out of these menu screens you need to develop a 'personalize' mindset. The most convenient way to make changes to your Windows 8 settings is to press Winkey +i. Alternatively, call for the Windows 8 charms. To get started hover your mouse over the top right corner of the screen, or else press Winkey +c. Select the cogs of the setting charm. Click on 'Change PC settings' at the bottom, see screenshot right. 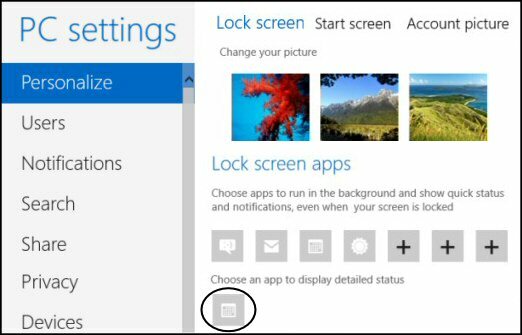 At the top of the list of PC settings is Personalize, it's here that you can change your account picture or select the Lock screen apps. One job for the Users settings is to change the Sign-in options, for instance, you could unlock your computer with a 4-digit PIN. Remember that selecting a PIN doesn't automatically change the way you sign in. Next time you logon observe link for 'Sign-in options', now you can select a PIN, or other option that you configure via the PC Settings – Users. The idea is that you can configure an app so that it delivers status updates. 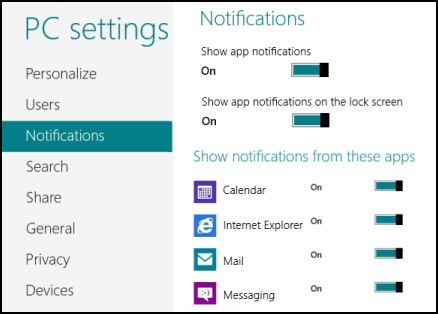 To do this visit the 'PC settings', and then select which apps should send alerts, or notification 'Toasts'. Alternatively, you can manage the notification 'Toasts' from within the metro-style app. The wireless configuration is reasonably easy, just move the black slider to on or off. You can also toggle Airplane mode in the same way. Choosing 'On' means that you can still operate apps, but they won't send or receive any data in Airplane mode. 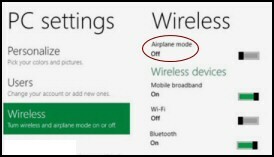 If you want to start receiving messages again then re-visit the PC Settings and move the Airplane mode slider to 'Off'. Note: If you need information about your mobile IMEI (International Mobile Station Equipment Identity) number, just click the name of the mobile broadband provider in the Wireless section. You can use the PC settings to check your App Switching. Click on the General menu, in the right-hand pane you should see a bar for App switching, make sure it’s set to ‘On’. Windows 8 encourages "user experience virtualization", this means you can sync settings between two or more computers. The benefit is that you get a familiar environment each time you sign in. Note 1: For sync to work, you need to sign into Windows 8 with a Microsoft account, also known as Windows Live ID. 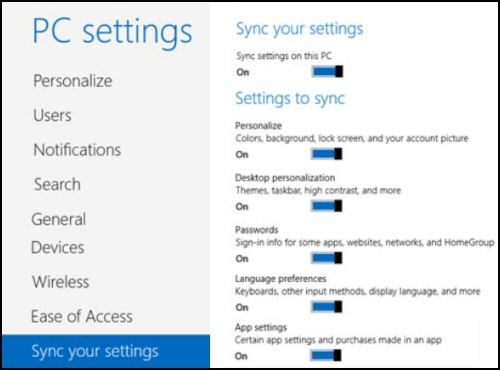 Spend a minute synchronizing your Windows 8 PC settings for desktop, languages and apps. Note 2: To synchronize your data files investigate Microsoft's SkyDrive. Instead of visiting the Control Panel to make configuration changes, the preferred method in Windows 8 is to call for the PC Settings with Winkey +i.